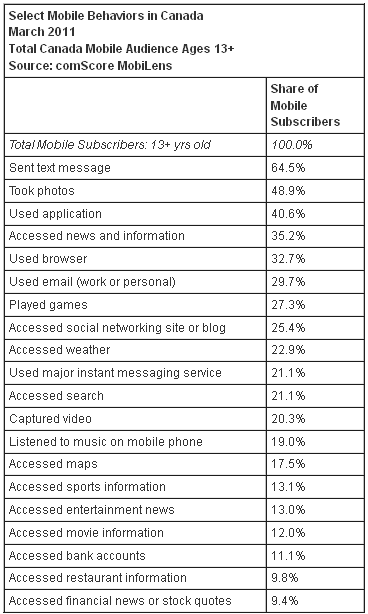 Last week, comScore shared some interesting information about mobile behaviors in Canada. 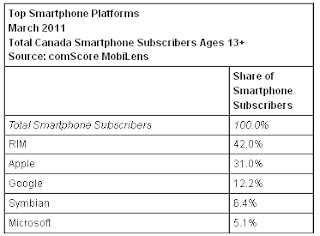 This coincided with comScores launch of their mobile measuring product, comScore MobiLens in Canada. This product presents a leading view on the Canadian mobile media landscape (as well as US, European and Japanese landscapes). It also looks like there are more Blackberry subscribers/users than iPhone subscribers/users as Research in Motion (RIM) has a 42% share of Smartphone subscribers. Apple is second with 31%. comScore MobiLens™ provides an unparalleled view of the U.S., European, Japanese and Canadian mobile media landscapes, connecting data on mobile consumer demographics and behavior with device capabilities to help you understand key technology and consumer trends in the dynamic mobile media market. 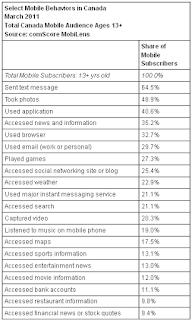 A great resource for gaining insight into the mobile audience.